"Whoever you are, bear in mind that appearance is not reality. Some people act like extroverts, but the effort costs them in energy, authenticity, and even physical health. Others seem aloof or self-contained, but their inner landscapes are rich and full of drama. So the next time you see a person with a composed face and a soft voice, remember that inside her mind she might be solving an equation, composing a sonnet, designing a hat. She might, that is, be deploying the powers of quiet." When I finished up a season of volleyball in Eighth Grade, I received an award that simply said "Shy Shelley." Did my coach think I would proudly display this on the fridge? Could she seriously not think of anything else to say? Maybe something actually related to volleyball? I thought I was a pretty good volleyball player. But apparently my personality overshadowed my skills. Then in tenth grade, I was told by a classmate that he thought I was a foreign exchange student from France because I never spoke (he thought I didn't know any English), and because our history teacher pronounced my last name with a French accent. In eleventh grade, I became a cheerleader. This was a little shocking to all who knew me. Did this mean I had magically transformed into an outgoing teenager who suddenly cared about popularity? No, I just loved to dance. (I had learned a few moves watching Janet Jackson videos.) I don't remember the exact wording, but I received an award at the end of the year that again focused on being "quiet." A quiet cheerleader. Now that's something to be proud of. When you're shy/quiet/introverted it's hard to escape the labels. But what's worse is the judgment that often accompanies them: you're somehow inferior to your more outgoing peers, you have an over-inflated sense of self, you're anti-social. And the most damaging of all is the idea that YOU NEED TO BE FIXED. The secret to life is to put yourself in the right lighting. For some it's a Broadway spotlight; for others, a lamplit desk. Use your natural powers--of persistence, concentration, insight, and sensitivity--to do work you love and work that matters. Solve problems, make art, think deeply (264). But this is not just a book to make introverts breathe a sigh of relief and feel gratified that someone is recognizing their worth. It's also very instructive for those who don't understand the "quiet" ones at school, at a party, or in the workplace. Introverts thrive in a different environment than their peers. Teachers, managers, parents, and anyone working with people would benefit from recognizing this and allowing all personalities to shine in their own way and at their own pace. I think we're twins. I am shy as well and was a cheerleader in high school. It was weird being part of that scene because I was never shy getting in front of a large group of people if I had a purpose. It's the large groups of small talk that I can't handle. I would hide in the library and do my homework rather than mingle during lunch, despite technically being "popular." I'm really excited to read this one. I have a library copy but just haven't had the time to get to it yet. I'm hoping I can convince my husband to read it as well. Maybe then he'll understand a little more about why I am how I am. Kristi - I think you may be right about being twins! I really want to read this. I keep seeing it pop up and I LOVE how you tied this back to yourself and your own experiences with being quiet. You should totally display your Shy Shelley award! Red - Thanks! I kept seeing the book pop up and knew I had to read it. I'll have to see if I've got the award up in the attic. Although I might have burned it or shredded it ;). I have got to get this book. I'm a super quiet and shy person too, and I remember all those obnoxious comments from people. Definitely love the idea that being quiet is a kind of power. Melissa - I mostly picked up the book because I thought it would be interesting, but I didn't realize that it would make me feel better about myself. I hope have a chance to read it :). I've been wanting to get a copy of this book for my son, who has always been an introvert. I never tried to change him. Instead, I consciously chose to honor him for who he is. Tomorrow, I'm off to a used bookstore. This is on my list of books to hopefully find and grab while I'm there. Satia - That's wonderful that you respect your son's personality. I have one child who is a bit more of an extrovert than the rest of us, and I have a hard time remembering that she needs to spend more time with people than we do! Your review is the one that pushed me over the edge and got me to put this on my wait list at the library. 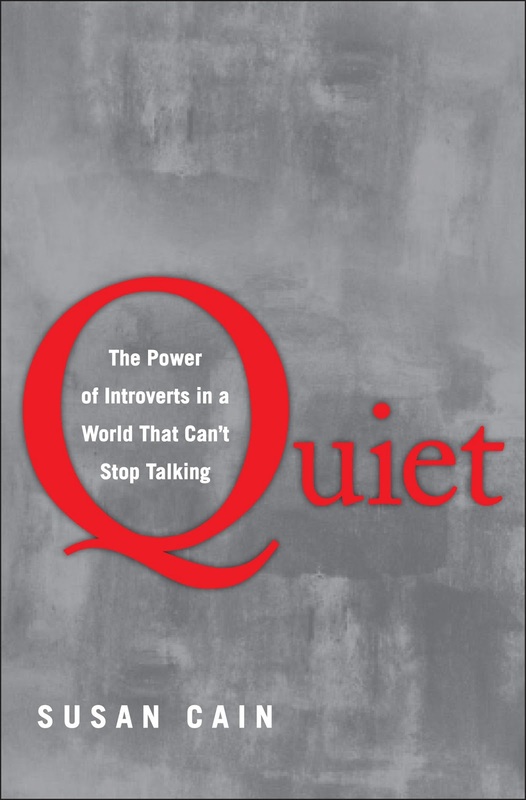 I can relate to it and look forward to reading it and feeling vindicated for "being quiet." I think all of us could use this advice: "seek first to understand, then to be understood." I was and still am a shy person. all of my teachers always told me to speak up! I hated it. Why! I wanted to shout, but never did. I may need to read this book and so when people say I'm shy I can spout off things to shut them up--okay that isn't polite. To tell them everything is okay--is that better. As an introvert, I really need to pick this one up.